I am in a card swap with a bunch of ladies from my MOMS club. I finally finished them all, all 18 of them!! 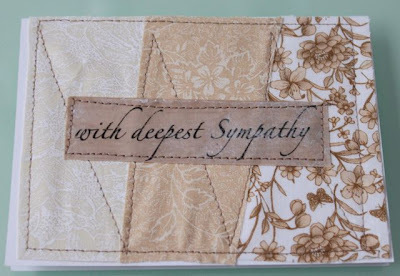 We all signed up for the type of card we were going to make. I chose sympathy. I knew I wanted to make these cards that I saw during Celebrating Mom on Made. I found some soothing fabric but wanted to add some text to the front. Then I saw a tutorial on How About Orange for transferring images from paper to fabric using gel medium. I had some gel medium and a laser printer so I decided to try it, and It was very easy! After all the word patches were cut out I sewed them on top. There were a lot of steps to these cards, but I spread it out over a few days so it didn't feel like work, it was fun. I can't wait to see what the other ladies make!! I'll be sure to post some pics!! they are so nice, soothing. Great job. These are pretty. You have a great eye for color and pattern combo's. Those are lovely, and I'm sure the person who receives them are going to feel so touched by the personal card. I just signed up to follow you. I'm a new blogger, and I'd love if you'd stop by and maybe return the favor. Take care! 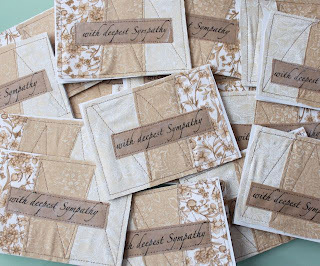 Just seeing these cards...makes me want to learn to sew for that purpose!